Now vying with the Marangu Trail as the busiest trail on the mountain, the Machame Trail’s popularity is justly deserved, with many porters and guides also naming it as their favourite. Also known as the Whiskey Route to distinguish it from the Marangu path (which is known as the Coca Cola Trail), the Machame Route takes in some of the finest parts of the mountain, including the atmospheric Shira Plateau and the lunar landscape near Barafu Campsite. And compared to the Marangu Trail, statistics show that the Machame Route offers a higher chance of reaching the summit too! 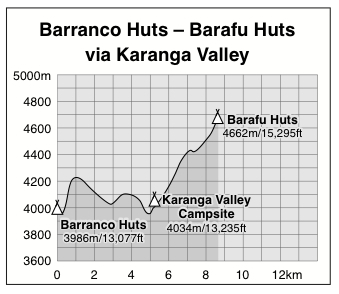 The following itinerary is for six days; those on a seven-day trek will, more often than not, spend a night at Karanga at the end of Day 4 (see below). Our adventure begins after breakfast at around 8am when our car arrives to pick you up from your hotel and take you to Machame Gate (1828m), where you must register. The first day of the trek takes you into the forest bearding Kilimanjaro’s lower slopes. It’s quite a sweaty uphill walk of 10.5km or so, though there is plenty to distract you as we look out for some of Kilimanjaro’s unique, endemic flora, as well as colobus and blue monkey and other creatures of the forest. We will also break for lunch while in the forest. At the day’s end we reach the upper limit of the forest and the Machame Camp (3032m), with views over the treetops to the plains below. Your porters will already have your tents erected and will be busy preparing dinner. About an hour after lunch, the gradient levels out slightly as we approach the Shira Plateau, with more celebrated Kilimanjaro flora such as groundsels and weird lobelias. 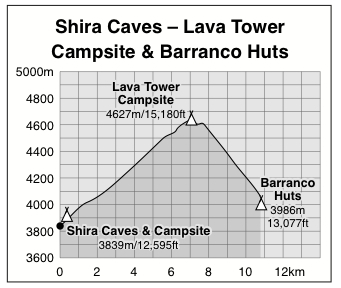 Our final destination on this second day is the Shira Cave Campsite (aka New Shira Campsite), with views up the plateau towards Kibo as well as westwards towards Kili’s little-known third summit, Johnsell Point. As with every campsite on the route, your tent will be erected and snacks will be served upon arrival, followed by a main meal later in the evening. The morning begins with a lengthy crossing of the plateau as we head due east toward Kibo. It’s a long walk but a very photogenic one with the snowy summit of Kilimanjaro a constant looming presence ahead; most people, I find, say that this is their favourite part of the walk. Lunch this time is taken near the Lava Tower, at the foot of Kibo. We are now heading into some serious altitude, with Lava Tower standing at 4530m above sea level. For this reason, it is normal for people to have a slight headache when they finally reach our campsite for the evening, Barranco Camp, following a steep descent to 3986m. This is entirely normal, and only worrying if the symptoms persist. By way of compensation, Barranco is the prettiest campsite on the route, set amongst a grove of senecio hard against the south face of Kibo. Snacks and then dinner is served in the evening. At the summit of the wall the path drifts and meanders gently to the Karanga Valley, a gorgeous little place where malachite sunbirds flit from flower to flower. If we were on a seven-day trek we would find our campsite lies at the top of the other side of the valley, a stiff but short climb up from the Karanga stream. Both lunch and dinner will be served at this campsite. But for a six-day climb we still have another three hours or so to go as we traverse the southern side of Kibo, walking through a spectacular lunar landscape bereft of life on our way to Barafu Camp, on the south-eastern shoulder of Kibo. Altitude Gained: 1233m to Uhuru Peak, then a descent of 2789m. It’s just a couple of hours further now from the campsite to Mweka Gate (1633m), where those who made it to the summit or Stella Point will collect their certificates. A car will be waiting to take you back to your hotel, and a land of warm showers and cold beers. Your trek is at an end.